To make your first online survey, you just need to register a free account. To do so, simply go to our registration page. You have the possibility of creating a free account using your email address. If you use this registration alternative, you will receive a confirmation email and you can login and start creating your survey right away. When your registration is completed, you can reach your account by simply logging in from any computer or tablet, at any time and from anywhere. All you need is a web browser to login. We have designed enquete.com to be platform independent, so that you can create your beautiful surveys without the need to install any software on your device. 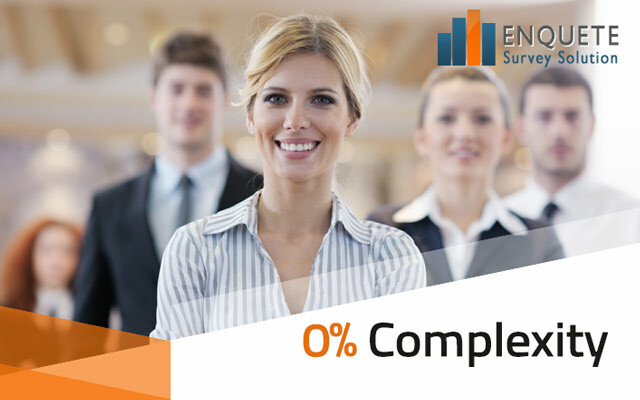 Additionally, when you become a member at enquete.com, you will always enjoy our software being up-to-date with the latest updates, newest features, and improvements, right after you login. When you navigate to the statistic page, you will first be presented with a time line chart. The time line indicates the number of respondents you get each day. By navigating to the statistics page, you will have overall statistics for your survey. There will be bar charts and pie charts that show a summary of your survey. If you have an open question in your survey, this will be represented in a wordle. The most frequent words will appear larger while the less frequent words will appear smaller. You can navigate to your account after you sucessfully login. On the left side you will see a navigation menu that contains shortcuts to other parts of your account. You can easily go to any part of your account via the navigation menu.